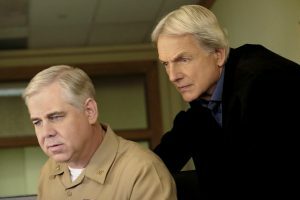 “Two Steps Back” – When evidence reveals an NCIS team member is a hitman’s latest target, the team must search through old case files to determine who is seeking vengeance, on NCIS, Tuesday, May 8 (8:00-9:00 PM, ET/PT) on the CBS Television Network. This is the final episode for series regular Pauley Perrette. “One Step Forward” – Sara Carter (Skye P. Marshall) begs Gibbs to investigate her mother’s murder as she believes the local authorities convicted the wrong man. 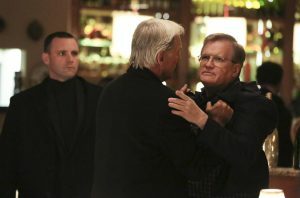 Also, Abby is awarded a dinner reservation for two to a brand-new five-star restaurant in an igloo and has to decide which coworker deserves to go with her, on NCIS, Tuesday, May 1 (8:00-9:00 PM, ET/PT) on the CBS Television Network. 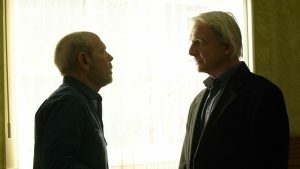 “Death From Above” – The NCIS headquarters are evacuated after the team discovers a body as well as bomb materials on the roof of the squad room. Also, the team reads the first draft of Ducky’s book, on NCIS, Tuesday, March 27 (8:00-9:00 PM, ET/PT) on the CBS Television Network. 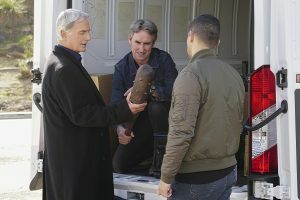 “One Man’s Trash” – Gibbs and Ducky see an antique war stick on television that could be the missing murder weapon to a 16-year-old cold case, on NCIS, Tuesday, March 13 (8:00-9:00 PM, ET/PT) on the CBS Television Network. Mike Wolfe of “American Pickers” guest stars as himself. “Handle With Care” – Gibbs and the team work to clear the name of retired Marine Sergeant John Ross (THE PRICE IS RIGHT host Drew Carey) when cyanide is found in one of the hundreds of care packages he sends to active-duty Marines, on NCIS, Tuesday, March 6 (8:00-9:00 PM, ET/PT) on the CBS Television Network. In real life, guest star Drew Carey served in the Marine Reserves for six years. 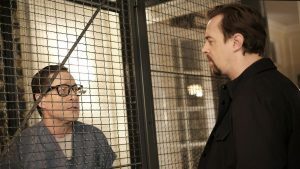 “Keep Your Enemies Closer” – NCIS strikes a deal with convicted murderer Paul Triff (French Stewart), giving him a 48-hour furlough at his former residence, now McGee’s home, in exchange for information that can convict his former cellmate, Gabriel Hicks (Graham Hamilton), the murderer who deceived Gibbs and Fornell (Joe Spano), on NCIS, Tuesday, Feb. 27 (8:00-9:00 PM, ET/PT), on the CBS Television Network. “Keep Your Friends Close” – After the body of a missing Navy commander is found, Vance orders Gibbs and the team to work with former FBI Agent Tobias “T.C.” Fornell (Joe Spano), the private investigator who was hired to locate him. Also, Bishop and Torres interview convicted investment advisor Albert Hathaway (Kevin Pollak) when the victim is linked to his highly publicized trial, on NCIS, Tuesday, Feb. 6 (8:00-9:00 PM, ET/PT) on the CBS Television Network. Patrick Labyorteaux Guest Stars as JAG Navy Captain Bud Roberts, Jr.
“Dark Secrets” – After a seemingly happy and successful Navy Lieutenant appears to have taken her own life, Gibbs and the team conduct a thorough investigation, interviewing family and friends from her past and present, on NCIS, Tuesday, Jan. 9 (8:00-9:00 PM, ET/PT) on the CBS Television Network. Patrick Labyorteaux guest stars as JAG Navy Captain Bud Roberts, Jr, who worked with the deceased. 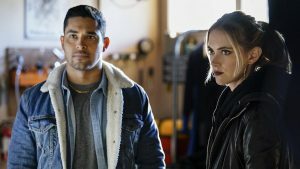 “High Tide” – Torres and Bishop go undercover as a criminal couple available for hire, during an NCIS sting operation tracking illegal drug-running out of the Norfolk civilian marina, on NCIS, Tuesday, Jan. 2 (8:00-9:00 PM, ET/PT) on the CBS Television Network.